I like to think of it as an action manual of higher awareness and applied intuition (but not “woo woo” at all!). You might think of it as your 20-year head-start on business success. I took my very first self-improvement workshop in the winter of 1980, it was called “Playground” written by Paul Larson of Summit Workshops. I went because I had just read Winning at Office Politics and I wanted to ingratiate myself at Texas Instruments with our operations manager. I was blown away by what I experienced and learned. Over the next 15 years I took every one of their workshops — and many of them several times. Since the beginning I knew I wanted to have my own company and I wanted to learn as much as possible about human nature (including my own), life, and the Universe… as applied to starting, building and managing a successful business. It never ceased to amaze me what would change in my world after I would reconcile some issue blocking me from being effective — first, I realized that most ‘realities’ were merely a point-of-view. When I changed my point-of-view — things changed. Sometimes everything changed… Even the telephone would ring from someone I hadn’t spoken to in years… A customer would call in an order… Stuff like that. We did workshops using horses in the Arizona desert. We learned scuba diving as well as many metaphors useful to everyday life gleaned from that training. I’ve taken workshops given by former EST trainers. I took all of Anthony Robbins’ courses… walked on fire (several times), climbed to the top of poles, dropped into a city for a 24-hour period with nothing, but a quarter and an apple (one you can eat). I started taking karate lessons about the same time I started Jian in 1988. I noticed many parallels between karate and business, and was inspired to tell all… I now have a 2nd degree Black Belt in TaeKwonDo. I learned to fly. Today I have 760+ hours and I’m instrument-rated. I even owned a 1980 Beech V-tail Bonanza (V35B). There are many things one can learn about business from flying an airplane, and I explain. I can’t tell you how many self-help, psychology, and business books I’ve read. Every one of them had at least several gems — I applied them and report on what works. I worked with former Summit Workshops trainers and former EST trainers who consulted with me for my company for many years. I’ll tell you what works. I belonged to TEC (now Vistage) — 12-15 company CEOs meet once a month, learn something profound from an expert, have lunch, then spend the afternoon solving each others’ problems. I could turn every session into a Jian software product. Most of that worked, and some of it needed some tweaking to make it work. I actually studied and documented what worked and what needed to be done differently. I have a lot to say, but I say it mercifully quickly. I share many anecdotes that will help you keep your head on straight while you build your business. but you can get the point immediately — enough to take action now to save yourself painful mistakes. I assure you that you will get a lot from it. 70+ tricks & tips to help you ideas to help you make better decisions faster. Build your business with what you already have! Picks up where the business schools, consultants, and gurus leave off… Refined ideas deal with the realities for successfully building your business. 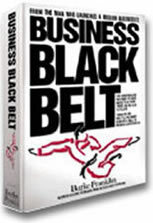 You can ask for Business Black Belt by name at your bookstore–they may have it in stock or can get it for you very quickly.